Nine years ago, Lehman Brothers collapsed and the economic world changed. This column introduces a new book that asks how the North Atlantic economy became so unstable that the failure of a medium-sized US investment bank could topple the entire North Atlantic region into deep recession, and the Eurozone into a depression. The answer lies in serial but different regulatory mistakes in Europe and the US starting in the 1980s. Nine years ago, Lehman Brothers collapsed and the economic world changed. Gone were blithe assumptions of increasing prosperity, rosy futures, and safe nest eggs backed by savvy policies, replaced by a new mediocre of low growth, lacklustre investment, and diminished respect for expertise (Cline 2017 estimates the average output losses from banking crises at 64% of output). The associated social and political discontents have led to a range of populist leaps in the dark. Appropriately for such a pivotal moment, there have been many books on the crisis. These have generally focused on immediate causes – complex banks appear full formed, securitised asset prices collapse, a crisis erupts in Greece, policymakers react to unexpected events – and examine either the US or Eurozone halves of what was a North Atlantic crisis. For example, Wessel (2009), Paulson (2010), Bernanke (2015), Geithner (2014), El-Erian (2014), Wolf (2014), and King (2016) on the US crisis; and Stiglitz (2016) and Brunnermeier et al. (2016) on the Eurozone one. My new book, Unfinished Business, is the first to deeply explore how the North Atlantic crisis happened, rather than what happened (Bayoumi 2017). It asks how the North Atlantic economy became so unstable that the failure of a medium-sized US investment bank could topple the entire North Atlantic region into deep recession and the Eurozone into a depression. The answer lies in serial but different regulatory mistakes in Europe and the US starting in the 1980s. By 2002 – well before the unsustainable macroeconomic boom that most books focus on really got started – the elements that drove the crisis were already in place. These included the rapid expansion of both increasingly fragile Northern European universal banks and US shadow banks that would eventually fund much of the US and Eurozone periphery bubbles. An obscure change in US SEC regulations in 2003, and a better-known change in the US bankruptcy code in 2005, helped to parasitically entwine these US and European excesses. The less well-known European half of the story involved several elements. Regulatory changes in the mid-1980s encouraged the creation of large universal banks in northern Europe that merged commercial banking (loans to clients) with investment banking (buying and selling assets). These banks thrived following an ill-conceived amendment to international rules that allowed them to use their internal models to assess the riskiness of their loans, assessments that were used to calculate required capital buffers on investment banking activities. Unsurprisingly, the banks exploited their internal models to save on (expensive) capital buffers and used the extra space to expand. The exploitation of internal risk models is apparent in Figure 1, which reports capital buffers as a percent of total assets (on the vertical axis) and risk-weighted assets (on the horizontal axis) for large European banks. The expected positive relationship seen in 1996 had disappeared by 2002 and had become negative by 2008. In this topsy-turvy world, by 2008 a universal bank where one euro of capital supported 60 euros of loans was assessed as better capitalised than a commercial bank where one euro of capital supported 12 euros of loans. Predictably, the universal bank was hit harder over the crisis. The risks from the rapid expansion and growing fragility of the universal banks was missed because competition across national regulators led them to focus on supporting their ‘national champions’ rather than safety and soundness – exemplified by the adoption of ‘light touch’ regulation in the UK and Ireland. US banking went through a better known, but equally misunderstood, transformation. Starting in the 1980s, deposits and loans were increasingly switched from relatively sound commercial banks to more fragile investment banks that formed the core of the shadow banking system (confusingly, despite being called banks, the investment banks were not covered by banking regulations). The process started in the 1980s as higher inflation interacted with outmoded interest rates caps to divert deposits from commercial banks to investment banks offering better terms. As deposits shifted, the commercial banks increasingly sold mortgages to shadow banks via securitised assets, a trade that worked because the shadow banks could skimp on (expensive) capital buffers. As seen in Figure 2, already by 2002 commercial banks were selling most mortgages via securitised assets. Source: US Flow of Funds. The financial systems in the two halves of the North Atlantic economy were thus undermined in different ways. The European banking system decayed from within as the northern universal banks became increasingly fragile, while the US commercial banking system was undercut by the expansion of equally fragile shadow banks. This difference explains why the European banking crisis was so much more harmful. Many core US commercial banks were sound enough to assist in rescuing the system, unlike the more fragile European universal banks. 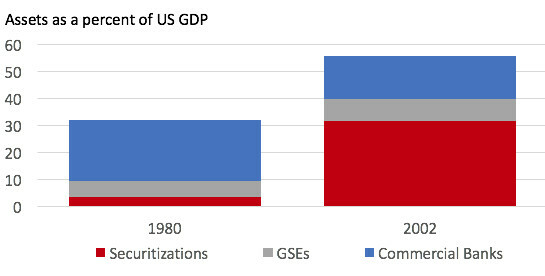 A 2003 decision on repurchase agreements (repos) by the US SEC and a 2005 amendment to the bankruptcy code helped to parasitically intertwine the increasingly fragile US and European banking booms. Repos were a convenient way for sophisticated investors to get dollar cash by temporarily loaning assets as collateral. The 2003 SEC decision expanded repo collateral to private US paper backed by mortgages and high-class foreign paper. The former was linked with a boom in high-yielding but unsafe mortgages dumped on the shadow banks, most famously subprime loans. The latter was linked with a massive expansion of northern European banks into the Eurozone periphery. Figure 3 shows that by 2008, northern European banks had loans amounting to 50% of regional output in the US and 30% in the Eurozone periphery. These inflows help explain the easy financing conditions that helped propagate the US and Eurozone bubbles – most notably, the Eurozone periphery was essentially able to borrow on the same terms as Germany. When the bubbles burst, these exposures meant that losses cascaded back and hurt northern Europe. Figure 4 illustrates the mechanics of the North Atlantic boom. A series of intellectual blinkers both allowed these bubbles to develop and increased the costs of the eventual crisis. Eurozone costs were magnified by its inadequate mechanisms to support sovereigns in difficulties, which originated in longstanding differences between the French and the Germans on the purpose of a single currency (see also Marsh 2011, James 2012). The French saw the single currency as a way of promoting economic integration, and pushed for mechanisms to provide support for countries during the transition to a smoothly functioning union. By contrast, the Germans saw the single currency as appropriate only after economic integration had been achieved, and therefore favoured an independent central bank and no support across sovereigns. After the fall of the Berlin Wall precipitated the creation of the euro, the resulting haggling generated the worst of both worlds. A ‘French’ early currency union with a ‘German’ independent central bank and ‘no bailout’ clause. Lax enforcement of fiscal rules precipitated a crisis involving a downward financial spiral in which banking problems pressured government finances, which in turn put further pressure on banks, and so on. This dynamic helps explain the depth of the downturn in the Eurozone even in the face of emergency financial support. Intellectual blinkers also explain why growing pre-crisis financial imbalances were missed. An overinflated belief in market discipline on banks led the US Federal Reserve to support the Basel Committee’s unfortunate switch to internal risk models – whose impact, ironically, was on European rather than US banks. Similarly, buoyed by an excessive confidence in the effectiveness of monetary policy, central banks focused on inflation rather than financial stability and prized independence over cooperation with other policy makers. Finally, international economic cooperation was undermined by a belief that spillovers from one country to another were small. These erroneous assumptions both allowed bubbles to grow and left policy makers unprepared to respond to their collapse. The outcome were major errors, such as the abrupt bankruptcy of Lehman Brothers. How effective has the response been to these deep weaknesses? On the policy front, the picture is mixed. US shadow banking has been tamed as major investment banks are now under the same – strengthened – regulation applied to commercial banks but there is now a backlash against tighter regulation. In the Eurozone, banks’ capital buffers have also been strengthened, but the major banks are currently still only using internal models to calculate the riskiness of their loans (see Adrian and Narain 2017 on the controversy on capital floors). And while the architecture of the Eurozone has been improved by allowing better support for members, this is limited to countries prepared to admit that they are in crisis. Encouragingly, bank supervision for the largest banks has been centralised at the ECB, but responsibility for the costs of bank rescues remain national. A more complete banking union and stronger macroeconomic and structural policies are needed to allow the single currency to move towards the smoothly functioning currency union the ‘French’ view envisaged. Intellectually, the macroeconomics profession is only slowly adapting to the lessons from the crisis. Despite a lot of work on macro-financial linkages and an acknowledgement of financial risks and the role of macroprudential policies in maintaining financial stability, standard macroeconomic models generally retain assumptions found wanting over the crisis – that financial markets are omnipotent, monetary policy is powerful, and international spillovers are limited. Those who do not learn history are doomed to repeat it. The North Atlantic crisis came from bad decisions made for understandable reasons. Without a better response to the deep policy and intellectual errors that drove the crisis, the region risks continuing the new mediocre. A true recovery will require accepting that there remains a lot of unfinished business. Author’s note: This column reflects my own views, and does not necessarily reflect those of the International Monetary Fund or the Peterson Institute for International Economics, where I wrote the book on sabbatical. Adrian, T and A Narain (2017) “Why Talk of Bank Capital ‘Floors’ Is Raising the Roof,” IMF Blog, June 8, 2017. Bayoumi, T (2017), Unfinished Business: The Unexplored Causes of the Financial Crisis and the Lessons Yet to be Learned, Yale University Press. Bernanke, B S (2015) The Courage to Act, W. W. Norton Press, New York and London. Brunnermeier, M K., H James and J-P Landau (2016) The Euro and the Battle of Ideas, Princeton University Press. Cline, W R (2017) The Right Balance for Banks, Peterson Institute for International Economics, Policy Analyses in International Economics 107, Washington DC. El-Erian, M A (2016) The Only Game in Town: Central Banks, Instability, and Avoiding the Next Collapse, Random House, New York. Geithner, T F (2014) Stress Test: Reflections on the Financial Crisis, Crown Publishers, New York. Goodhardt, C (2011) The Basel Committee on Banking Supervision: A History of the Early Years 1974-997, Cambridge University Press, Cambridge and New York. James, H (2012) Making the European Monetary Union, Belknap Press of Harvard, Cambridge Massachusettes and London England. King, M (2016) The End of Alchemy: Money, Banking, and the Future of the Global Economy, W. W. Norton, London and New York. Marsh, D (2011) The Euro: The Battle for the New Global Currency, Yale University Press, New Haven and London. Paulson, H M (2013) On the Brink: Inside the Race to Stop the Collapse of the Global Financial System, Business Plus, New York. Stiglitz, J E (2016) The Euro: How a Common Currency Threatens the Future of Europe, W. W. Norton New York and London. Wessel, D (2009) In FED We Trust: Ben Bernanke’s War on the Great Panic, Crown Business, New York, 2009. Wolf, M (2014) The Shifts and the Shocks: What We've Learned--and Have Still to Learn--from the Financial Crisis, The Penguin Press. Goodhart (2011) discusses the adoption of the Basel Committee’s 1996 Market Risk Amendment.